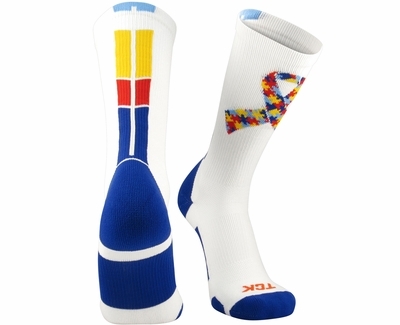 PUZZLE RIBBON AUTISM AWARENESS CREW SOCKS ... These Bight & Colorful Puzzle Ribbon Autism Awareness Crew Socks from Twin City will show your support for a great cause. Puzzle Ribbon Crew length Socks (shorter than knee high) feature a Colorful Ribbon made of Puzzle Pieces on the front of the socks, with a multi-color Double Stripe up the back side of the crew socks. The puzzle pieces and stripes include the colors royal blue, scarlet red, yellow gold, and columbia blue. 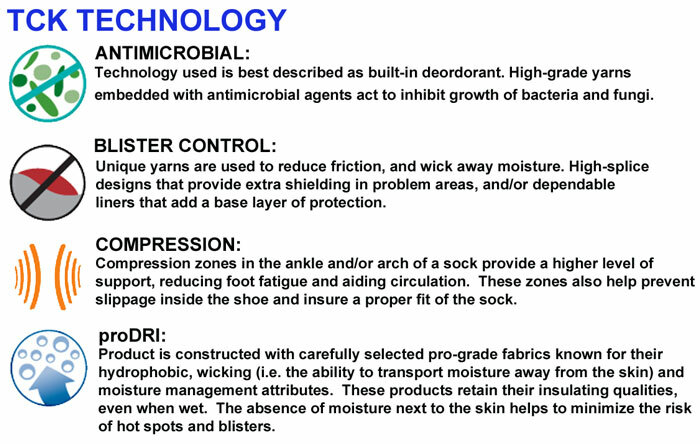 The crew socks also feature Sewn-in Heel construction, ProDRI Moisture Management, Blister Control protection, Mesh Instep, Compression Zone in arch for higher level of support, and AntiMicrobial deodorant agents. 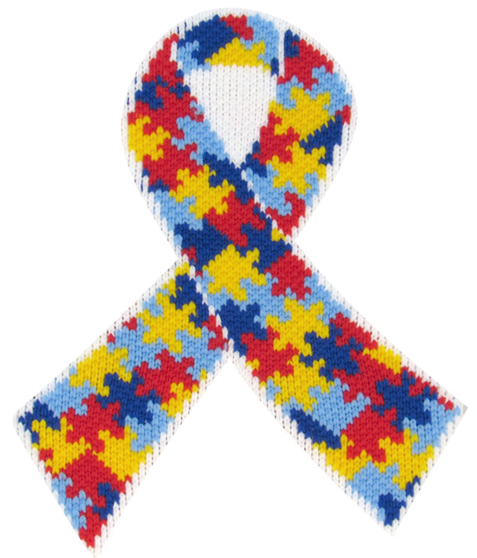 Ribbon Puzzle Autism Awareness Crew Sock Material: 79% Polypropylene, 13% Nylon, 6% Elastic, & 2% Lycra Spandex. Colorful Puzzle Ribbon Socks Sizing: * * (approx. sizes) Socks will fit tight & they may run slightly smaller than shoe sizes listed below. They're NOT intended to be worn over shin guards, etc. * You can Mix & Match Sizes to get Quantity Prices! Care Instructions: Due to the sewing method of these Puzzle Ribbon Autism Crew Socks - Machine Wash and Dry on Low Heat is recommended. Socks should also be laundered inside out, to prevent pilling and fuzzing. DO NOT BLEACH. Bright & Colorful Puzzle Pieces Autism Ribbon Crew Socks are great to wear while playing many Sports: Volleyball, Soccer, Basketball, Softball, Tennis, Cheer, Dance, Lacrosse, Baseball, Football, Running, etc... So make sure to buy enough for the whole team, and all your friends. 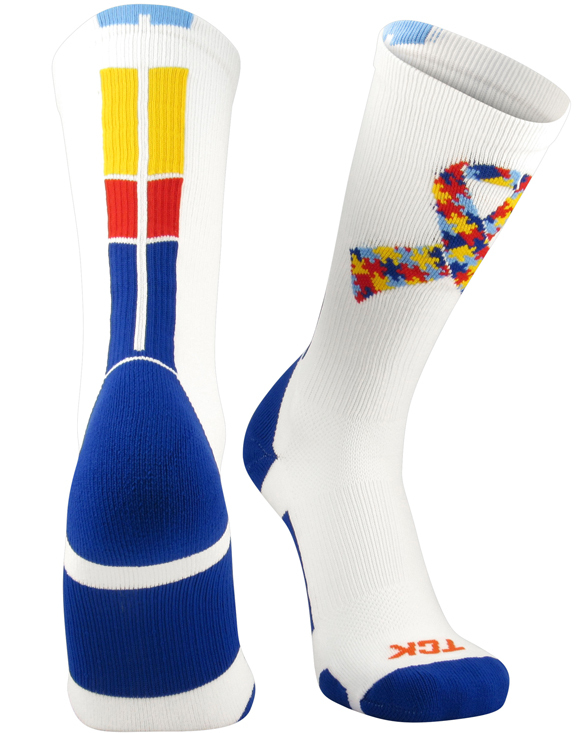 Show your Support and Make a Difference when you purchase these stylish Puzzle Ribbon Autism Awareness Crew Socks. Support the Cause - a portion of the proceeds from the purchase of these Autism Socks will go to support appropriate charities. NOTE: We've done our best to show the true color of these Puzzle Ribbon Autism Socks, however since all monitor resolutions and brightness settings are different, these bright colors may look different on your computer screen. PLEASE call us if you have any questions about color-matching to uniforms, etc. Thank You.